Get Busy Dehydrating Cabbage for Soups and Coleslaw! Dehydrating Cabbage: Yes, it can be done and is one of those vegetables that doesn't immediately spring to mind as being able to dehydrate – because it seems so dry to begin with – but it works very well! A plus when slicing is that one head of cabbage goes a long way... and it's a great source of vitamin A, vitamin K, and Folate. It's not lacking in the mineral department either: it's a great source of Potassium and a good source of Calcium, Phosphorus with trace minerals Selenium, Zinc, and Manganese. Cabbage also contains Omega-6 fatty acids too. Add Shredded Cabbage To Soup! I love to add shredded dehydrated cabbage to my vegetable soups, just drop it in – it's that easy– and it cooks along with the rest of the vegetables. Of course cabbage is used for the traditional coleslaw too. What summer picnic would be complete without it? When you're ready to re-hydrated your cabbage, see how to re-hydrate dehydrated food HERE. Don't forget to add cabbage to your vegetable smoothies too. 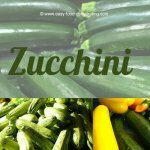 It's a delicious way to "eat yer veggies!" You can either re-hydrate the cabbage first, or add it to your smoothies "dry" - it will pretty much disintegrate in your blender. TIP: This is my FAVE knife by Trisha Yearwood. I don't miss my old Rachael Ray one that had an orange handle that went "funny/slimy." Trisha's knife cleans up easily too. 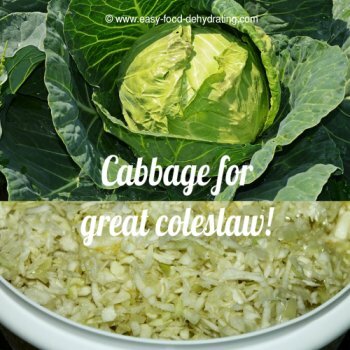 Makes easy work of cutting and slicing so you can get busy dehydrating cabbage! Fully dehydrated cabbage will be brittle when fully dried. Drying time: between 7-11 hours. Please remember to rotate your dehydrator trays, for even drying. It's hard to believe, isn't it, that one head of cabbage filled seven Nesco dehydrator trays – and when you're done, it ALL fits into this soup bowl! Store your cabbage in Mason jars for using often for soups etc., or store in vacuum-sealed bags for long-term food storage. For great prices on Mason jars, check out Amazon – see the image links above.